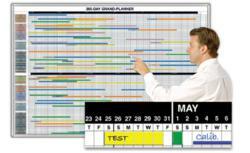 Magnatag’s magnetic GrandPlanner whiteboard simplifies long range, detailed project planning and record keeping. You can think, write and talk about your grand plan, but until you put on the wall for all to see, you may be the only one “seeing” it. This new magnetic GrandPlanner whiteboard organizes the process and helps you plan, track and display up to 88 line items in detail against a 1 or 2 year daily timeline scale. GrandPlanner grid lines are heat fused printed into the magnetic porcelain-like steel white board and designed to stay like new for a lifetime of daily use. They come in 5 sizes with 365 and 720 day versions for up to 88 line items. For full details go to http://www.magnatag.com/GRANDPLANNER or call 800 624 4154 and talk to a visible systems specialist. About Magnatag® Visible Systems: a division of W.A. Krapf, Inc., they design, manufacture and direct-market over 2,300 magnetic printed steel task-specific and all-purpose whiteboard scheduling kits including calendars, maps, custom printed whiteboards, a full line of magnets and accessories (many patented) and other information display systems for industry, hospitals, schools, business, organizations and government. Their 46th year, a family company http://www.magnatag.com.